Music doubtless retained an important position in Turkish life as it developed and diversified under Islam. As the Turks entered the realm of Islamic culture, the most fundamental change to come to their music was in their musical system. Though makam music is not strictly a phenomenon of Islam, it is certain that before the Turks' conversion to Islam, they used other musical systems. When the Turks, following the pentatonic and heptatonic systems, became acquainted with the makam music of western Asia and Anatolia, they excelled in this area and produced musical masterpieces. Great developments in Turkish literature also appear after the 13th century. The activities of poets and philosophers such as Yunus Emre and Mevlana were influential in the development of new music. 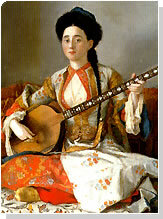 The Ottoman period was one of history's most brilliant periods from the standpoint of musical culture. One of the most significant musical events of the 13th century was the systematization of their music; the first and most important work in this area is the Kitâbü'l-Edvar by Safiyüddin Urmevi. During the late 14th and early 15th centuries, Yusuf bin Nizameddin, Abdülkadir of Meraga, Hizir bin Abdullah and Ahmedoglu Sükrüllah were the first to research Ottoman music and musical systems. Later on, the Mizika-i Humayun, whose teaching we could consider the palace conservatory, became the environment for the dissemination of music among the Ottoman elite. The ancient Anatolian cultural heritage which passed from the Selçuks to the Ottoman Empire was kept alive and constantly improved upon during all of the Ottoman periods. Though its roots are in Central Asia, a unique and advanced level of makam music is apparent in Turkish music, which spread throughout the Mediterranean basin. Up until the first quarter of the 20th century, one can speak of unique genres and styles of Turkish music at various levels of village and city life. This music, embellished by the conditions borne of every period and social event, has survived to our day and is still practiced. Thus being the situation of Classical Ottoman-Turkish music in the beginning of the 20th century, there was also a folk musical tradition, also with its roots in Asia, which spread to the four corners of Anatolia. In the hands of local artists and minstrels, a rich repertoire developed which gave voice to all the natural and social events experienced by Turkish society.